Though they're not exactly cuddly, Krawks make excellent Petpets. 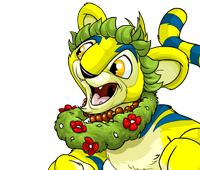 Just don't let them near the Fungus Caves, or you'll have a full-grown Neopet on your hands! Now you can draw your very own Krawk Petpet in just thirteen simple steps! Start by drawing a large egg-like shape for the Krawk's body. At the top of the body shape, draw the Krawk's head. Next, add two short legs to the bottom of the body shape. On the right side of the Krawk's body, draw its arm. The Krawk's other arm is mostly hidden from view because the Krawk is turned to one side.